We provide a wide range of fresh and silk flowers to your door or workplace within 24 hours free of charge. We identified that many clients were unable to decorate the UPVC front doors as they didn’t know how they could hang their wreaths on the door without damage. 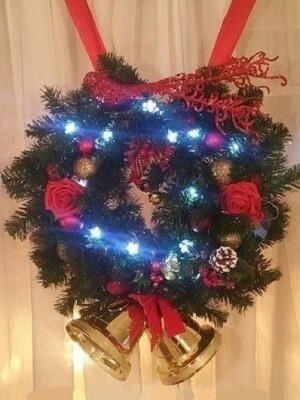 We designed a large Christmas door wreath that could be hung by soft red ties over the corner of doors. This doesn’t interfere with the door mechanism in any way. 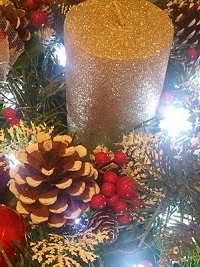 Our wreaths have large red roses, some sprinkled with glitter, pine cones, Christmas tree balls, ribbon and are lit by battery operated lights. Our wreaths are made to measure and we are happy to come and fit to your own measurements. 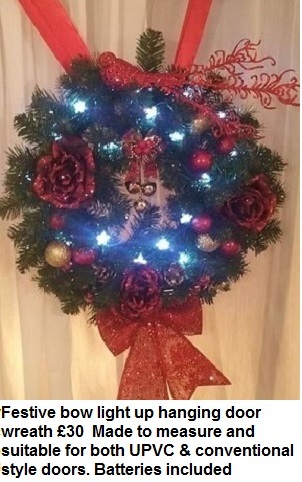 Our wreaths are very popular. As they are different to other retailers and have that unique personal touch, we have set the trend with a new unique Christmas look.